PART 1: Leica Summicron 90mm f2 vs Leica Summilux ASPH 75mm f1.4? Leica Summicron 90mm f2, a photo by MatthewOsbornePhotography (Leica) on Flickr. For Leica portraits I love my photos taken with the Leica Summilux ASPH 50mm f1.4 but I wanted to be able to get closer to my subjects. This gave me 2 real options. Leica Summicron 90mm f2 or Leica Summilux ASPH 75mm f1.4. Both lenses focus at 1M. Some of the other 90mm lenses do not focus as close and the 75/1.4 is the fastest 75mm lens and the 90/2 is the fastest Leica M mount lens. The 75mm focal length is not hugely different from 50mm whereas for a 3 lens setup a 28mm (or 35mm), 50mm and 90mm makes more sense. The Summilux 75/1.4 is would be easier to focus without a viewfinder magnifier however the Leica M9 does not have 75mm framelines. The deciding factor was the used price of both lenses. The 90mm f2 Summicron can be picked up for 5x less than the 75mm f1.4 Summilux ASPH. The only risk with either of these lenses is due to the very shallow depth of field it is possible that the rangefinder calibration on the Leica M9 does not align with that of the lens. As a result images may appear soft with the lens used wide open up close even though the lens is plenty sharp enough. After seeing a newly listed Leica Summicron 90mm f2 on eBay I bought it straight away. There are a few different Summicron 90/2 lenses available. I got the Pre-M 1973 style version. It has a silky smooth slide out hood and newly serviced crisp aperture ring clicks. I was very lucky in that the seller happened to live locally so I was able to take my M9 with me to test before buying. I was lucky and my lens is indeed sharp wide open on my M9. I would not stay razor sharp but plenty sharp enough for female portraits. Looking forward to seeing the Summicron 90/2 rendering and bokeh when used outside! I’m planning to use the Leica M9 + Leica Summicron 90mm f2 combo on my next studio shoot so results to follow. If you want to see what the lens looks like Ken Rockwell did a great Leica 90mm f2 comparison here. Leica Summicron 90mm f2, a photo by MatthewOsbornePhotography – Leica Photographer on Flickr. My latest lens arrival, the mighty Leica Cron’ 90mm f2 lens (1973 version) is proving quite a hit on Flickr. This photo of model Emma was taken during my first studio session with the 90/2 on my Leica M9. I posted the image to Flickr and it received more fav’s in the first 24hrs than any of my 3000+ photos have ever received in all the time on Flickr. Quite an achievement! I bought the 90/2 lens on eBay after seeing it at 4x less cost than the Leica Summilux 75mm f1.4 lens. I had my heart on the 75/1.4 but my brain too over and I got the 90mm instead. The lens has a super silky pull out hood and crisp aperture clicks. It is not a small or light lens by Leica standards but it now lets me achieve the shallow depth of field I crave. The shallow DOF look was a norm for me and my Nikon D800 using lens such as the Nikkor 200mm f2 AI-s, Nikkor 50mm f1.2 AI-s, Samyang 85mm f1.4 and Zeiss Pancolar 80mm f1.8. When I moved over to Leica M lenses and my Leica M9 I struggled with the 0.7M closest focus. Now with the 90mm Cron this is not an issue. I think the Leica Summicron 90mm f2 offers great value for money in Leica lens terms. I’m very happy with my purchase and can’t wait til the next shoot! Here is another shot with the Leica M9 + Summicron 90/2. The Leica Cron is fantastic for portraits. 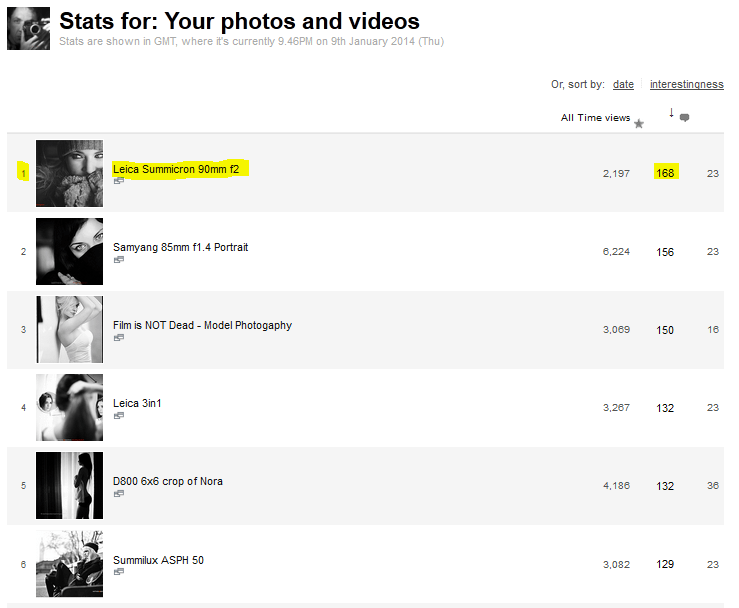 And here is my Flickr stream most liked images! More samples coming soon. I think this lens is going to get well used! I’ve got a Summilux 75 that focuses up to 70cm close. There are different versions available. Thanks. My apologies for the miscommunication. Yes the 90/2 has a reproduction ratio of 1:9 and 75/1.4 has 1:8 (and as a comparison the Lux 50 ASPH is 1:11). The 75/1.4 is still a ‘better’ lens in my eyes but at this stage too expensive for me. I have the 90 Summicron, an early version via Canada with the tripod mount. I like it a lot. It has served me very well from portraits to candids to landscapes to urban environs. When I’m out and about, that lens is one of three I carry, the other 2 being the 50 ‘cron and the 28 Elmarit [2.8]. I’ve looked at the 75 ‘lux and it is very nice, but I’d rather use the funds for something else since I’m pleased with the 90. Ah nice Leica trio! I have the Voigtlander Ultron 28mm f2 but also the CV Nokton 35mm f1.2 ASPH ii so it’s tough to chose at the wider end. I have been tempted by I Leica Elmarit but I think the extra stop of light is needed for UK Leica wedding photography. For the 90mm I bought it mainly to use up close as without a magnifier I think I would struggle to focus it at mid distances. I’ve not had chance to try it properly yet so looking forward to that. My copy is a black 1973 style Canada version with tripod mount and will fit a VisoFlex. I love the idea of thr Visoflex but I guess I would need an adapter to fit my 90/2 into and then a Visoflex III to fit the Leica M9. Next Next post: Nikon Lenses For Sale!